In a truly eyebrow-raising CNBC interview, Matthew Lynn alleges that Europe shall be saved! (As if by the grace of God!). With Europe on the brink yet again Germany will act. The Greeks can’t carry on with the austerity being imposed on them. No country can be expected to endure annualized falls in GDP of 7 percent or more,” he said, “and 50 percent youth unemployment for years on end. On Tuesday we learned that the Greek economy shrank by another 6.2 percent in the latest quarter. It simply isn’t acceptable” Lynn said. But Germany and the rest of the EU could come up with a Marshall Aid-style package for Greece. Very little of the bail-out money so far has gone to the Greeks. It has all gone to the bankers. Forget talk of a ‘Grexit’. There will be a mega-bail-out—a ‘Grashall Plan’—instead. And when it happens, the markets will rally on the news. At various stages in the last two years everyone from China, to Germany, to the Fed to the IMF, to Martians, to the Imperial Death Star has been fingered as the latest saviour of the status quo. And so far — in spite of a few multi-billion-dollar half-hearted efforts like the €440 billion EFSF — nobody has really shown up. Perhaps that’s because nobody thus far fancies funnelling the money down a black hole. After Greece comes Portugal, and Spain and Ireland and Italy, all of whom together have on the face of things at least €780 billion outstanding (which of course has been securitised and hypothecated up throughout the European financial system into a far larger amount of shadow liabilities, for a critical figure of at least €3 trillion) and no real viable route (other than perhaps fire sales of state property? Sell the Parthenon to Goldman Sachs?) to paying this back (austerity has just led to falling tax revenues, meaning even more money has had to be borrowed), not to mention the trillions owed by the now-jobless citizens of these countries, which is now also imperilled. What’s the incentive in throwing more time, effort, energy and resources into a solution that will likely ultimately prove as futile as the EFSF? The trouble is that this is playing chicken with an eighteen-wheeler. While Draghi might be making noises about “continuing to comply with the mandate of keeping price stability over the medium term in line with treaty provisions and preserving the integrity of our balance sheet” (in other words, not proceeding with the fabled “mega-bailout” even if it fractures the Euro), we may well see a full-blown financial meltdown (and of course, the ramifications of that on anyone who is exposed to the European banking system) unless someone — whether it is the ECB, or the Fed, or the IMF — prints the money to keep the system liquid. There are really two layers to bailing out the insolvent nations: the real bailout is of the banks who bought the debt, and the insolvent nations are just an intermediary. Should the insolvent nations become highly uncooperative, it seems more likely that the insolvent nations will just be cut out of the loop (throwing their citizens into experiencing a forced currency redenomination, bank runs, and even more chaos) while policymakers continue to channel money into “stabilising” the totally broken global financial system — because we know for sure that a big disorderly default will likely cause some kind of default cascade, and that is something I am sure that (based on past form) policymakers will seek to avoid. How close to the collapse we will come before the money gets printed is another matter. Given that it is predominantly Germans who are in charge of Europe for the moment — with their unusual post-Weimar distaste for monetary expansion — it seems to me like just as we have seen so far, the money will come at the last minute, and will just keep things ticking over rather than actually solving anything. And ultimately, I think it is the social conditions — particularly unemployment levels — that matter more than whether or not the financial system survives. If the attendant cost of ad hoc bailouts (in the name of pretending to stick to the ECB mandate) is a continued depression, and continued massive unemployment and youth unemployment then politicians are focusing on the wrong thing. The problem is that as conditions continue to fester and as solutions seem distant and improbable that Europe’s problems may become increasingly political. As the established (dis)order in Europe continues to leave huge swathes of people jobless and angry, their rage and discomfort will be channelled toward dislodging the establishment. As we have seen in Greece and France, that has already produced big lifts for both the Far Left and Far Right. We already know, I think, that in Greece’s upcoming election the outsider parties will crush the establishment, with SYRIZA most likely emerging on top. A key metric for me in the next few weeks will be Golden Dawn‘s proportion of the vote. This entry was posted in Economic History, Economics, Fixed Income, Inflation, International Relations, Musings, Philosophy, Politics and tagged bailouts, black swans, christine lagarde, cnbc, europe, federal reserve, hollande, holy roman empire, imf, keynesianism, nationalism, nazis, pathologisation, paul krugman, weimar republic. Bookmark the permalink. Hitler was a Keynesian though, I read somewhere that the pre war German edition of Keyness’ famous book in the preface basically admired National Socialism or even called his economic theory a national socialist policy, it was removed from later editions. Can Keynianism save us again no. 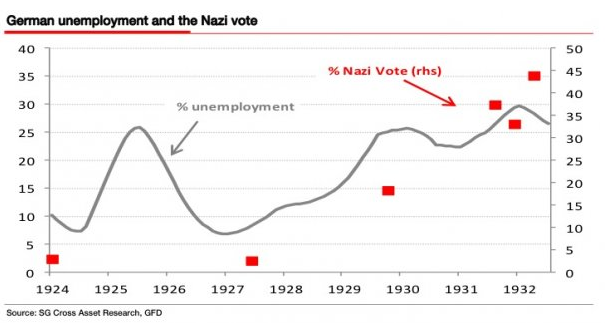 Voters are a crowd, irrational and wild, can high unemployment lead us to extremist governments like the Nazis? Yep! I have 50k of cash in a British bank, I am trying to convert it to property fast…should I be panicking? Hitler was to some degree a Keynesian (i.e. he believed in stimulus in practice, though maybe not the full economic implications of Keynes’ arguments), but let’s not get ourselves accused of reducto ad Hitlerum. Personally, I think cash (especially GBP which is a relatively stable currency) is useful to have as it is still the de facto norm, so long as you balance it with gold/land/homes/car/fuel/food/water/solar panels, etc stuff Bernanke cannot destroy. I’m not quite as concerned about a Nazi-esque militarized nationalist party arising from Greece. 2) Greece is not Germany in terms of industrial development. Greece cannot furnish a sizable military; Greece has little coal (today, oil) or steel. They could easily be sanctioned. People are pissed, and will xenophobically scapegoat, but probably not on any Final Solution scale. I’m Greece must exit, devalue, and model after Iceland. In a few years, the tourism will be dirt-cheap and they’ll have access to credit again. Best of all, the country won’t be ransacked by international bankers. It all depends how bad conditions get. When countries go mad, and people get angry, it’s hard to put things back to normal. I very strongly doubt we will ever get anything like the 30s-40s, but crazier things have happened. I am going to enjoy reading the phrase that the Central Bankers and IMF policy wonks come up with to describe the system/method/tool/solution to solving the problems we face. Read: Perhaps they will drop interest rates on credit cards, as a way of stimulating demand. I mean if someone goes into debt the government will back stop the credit card company. The catch is they’ll take away certain rights. Since the 80’s we have had declining interest rates and borrowing fuelled economic growth. With interest rates at near zero (but not on Credit Cards) I don’t see how we can have consumer driven demand unless credit is reduced on credit cards. No one will borrow to buy a home. That is too big a commitment. But borrowing to satisfy immediate needs that people feel confident in spending is a solution. It may just break the negative cycle enough to stimulate business invesatment, while we work off the debt overhang. Sounds like institutional credit card prostitution. The fact is that Greece has deep structural problems and they’ll have to endure years of pain whether or not in the euro. I can tell from personal experience that having your own currency does not magically make things better. This can be especially dangerous for Greece because they come with a sense of entitlement (years of prosperity) that other countries that had to endure the pain of structural reforms didn’t have. If they want to try and sustain the status quo they need to do a full multi-€ bailout of everything. But all roads seem to lead to a systemic reset, some faster than others. Greece can be an amazingly prosperous country with some hard work and honesty. I think the Euro system was fundamentally dishonest because interest rates on Greek debt were tracking German debt, which was patently insane. The bond buyers created a lot of the dishonesty by buying the debt. If Greece had no debt buyers they would have had to do structural reforms long ago at a better time. Will people just forget the nasty bits of history and implement the economic policies of the 3rd Reich. Worked then and will work again. Business is the most efficient method to implement projects, and when mandated by the government, it is the best way to kick start the economy. Obama blew his chance in 2008-2009 when he could have implemented nation building projects that focussed on the future. Instead there were piecemeal projects like 5 foot long concrete sidewalks and paths. GM could have been mandated to gear up its electric car programme, like Hitler’s Volkswagon. China is effectively implementing these policies now. I am sceptical of the stimulus approach, because in this kind of environment the money doesn’t end up in the real everyday economy, it ends up in the bank accounts of rich people and commodities speculation raising global food prices, etc. But certainly some infrastructure programs would have helped. Certainly, Western infrastructure is crumbling. If I had been running a nation in 2008 we would have done some very big infrastructure projects, as well as slashing regulation and taxes, and I like to think we would likely have lower deficits than the nations engaging in “austerity” today. Though make no mistake that unless there’s a coordinated global default by everyone, each individual defaulting country will have to take austerity probably under IMF’s supervision (just so that they won’t end up without electricity or basic medicines). I think eventually if this does happen there will be some kind of reset agreement, emerging out of chaos. That’s why I don’t like the idea of a reset. Roubini also predicts war with Iran next year which coincides with Bonner’s educated guessing predictions. And I should say that if the Greeks want to work hard and be honest they might as well start now (you know the first dishonesty was on them for fudging the data so they can get inside the EZ). This brinkmanship of the type “we want the euro, just give us more money” is distasteful to me – and I would say could never happen in my country (we’re poor, but at least we’re humble and here people generally look with respect towards the EU as some sort of an anchor in a perilous world). Infrastructure is a shared commodity, and usually is so high in cost, it needs Goverment funding. But how do we avoid waste and pork barrelling? I may add, that electronic tag toll roads are a good idea when trying to charge users, and a public private partnership can work, provided that the tolls charged are not extortionist. I think the best way is now using private operators to build public assets, and a user pays scheme using current technology. In Australia our fuel taxes do not completely go back into roads, so it is a regressive tax. Hence why our population is entred around major cities. If we don’t have world wide co-ordinated public works programmes, I fear the next thing will be war. There is a large population in Indonesia to Australia’s north, and if a General promises the impoverished youths to fight in return for booty, Australia and its huge resrerves of resources are ripe for the picking. I agree with Bill Bonner that we should not stray too far from real productivity and real wealth which was what the barbarous gold standard supposed to tie us to (of course, to people this bind will always be thought of as a “limitation” of the gold standard which must always lead to the abandonment of said barbarous standard). And if we don’t stray too far from real wealth and real productivity in the first place, we won’t have to ask ourselves stupid questions like “what are the best jobs the government should create?”. What kind of crackpot system do we have…where the president can create jobs…like the Fed creates money…out of thin air? Of course, we know the answer, the new jobs are just like the new money; they’re not real. Please sir. I want some more! Greeks are pulling Euros out of banks. Where to put that money? Gold is still looking worthy. Of course the selling is related to risk off, and I am down. But like the last crisis where it dipped, it did not take long to double. I can’t see these Politicians solving anything. All their Economic policy advisors have lost all answers. They would not turn to the Austrians. Not enough work experience! Gold will start to soar when the money printing starts, mostly because the market has the misimpression that gold is an “inflation hedge”. I think many Greeks will seek “safety” in USD and GBP, and only a few will look to gold. We shall see. This is the great question I think. Will European leaders continue to prioritise bank bondholders, or their own populations. And just who are bank bondholders? It’s a thoroughly opaque business, but you can be damn sure the overwhelmimg majority of bonds are owned by very rich people, in the final analysis. As for European leaders, who knows? I would always have expected American and British leaders to bail out the banks no matter what, but I wouldn’t have thought French, Italian, Spanish and German politicos to do the same. I would imagine thay would prioritise industry or agriculture for example, rather than banks. Will the Spanish govt put their country through years of austerity so that JPM doesn’t have to pay out on the CDS they wrote Kyle Bass? I dunno. I honestly think we’ll see a revolution in a lot of these countries if they continue with the misery of austerity in the name of placating creditors. Creditors are going to have to learn that sometimes they will be better off overall if they accept a loss on their investments and allow the nations to recover. Unfortunately a big problem is that in today’s hyper-leveraged environment that very often creditors are living so close to the wall that they cannot afford to take a loss…. Yeah, a series of revolutions may well result, as may a credit default cascade. Shocking stuff. And what the f*ck is Mathew Lynn on about? The Germans aren’t going to keep shovelling money into the ungrateful mouths of the Greeks, just so the markets won’t take a hit. Nope if they shovel money, they’ll shovel it directly to the banks cutting Greece of the equation. What happened to soveriegn risk, and the respective rate of the Government Bond. If you can’t honour your debts, you pay a higher price. The Greek (And PIIGS) Bonds implicit rates were artificially suppressed. You can’t get 25% and expect to be paid. Anything over 5% (double inflation) is a ticket to default. Bondholders will have to take a default and live with it. Government will have to live within its means. People will have to pay higher taxes. Everybody now has to pay for their once free lunch. I agree Buddy, and this is the message that should be pounded non-stop by MSM, not the idea that we’re entitled to heaven on earth because we were born on the chosen land or something (which is actually the mindset that leads to revolution – Greece is still much better off than us for example, or many other countries for that matter, but those others don’t speak of revolutions). An entitlement culture is hard to destroy, Andrei. It seems to me that Roubini’s idea that Greece is better off outside EZ (I don’t disagree, I’d even give them a hand to help them out ASAP) is all based on mass psychology. The idea seems to be that people want relative growth all the time; it doesn’t matter if you’ll drop to Belarus-levels of poverty if after that you’ll grow by 0.5% per year; it seems this will always win over 10 years of “depression” with YoY decreases in economic output even though this leaves you relatively rich all this time all the way through to the end of this depression. As far as I can tell Meg Greene and Nouriel Roubini are pretty irrelevant. Roubini’s shtick has long been PRINT A TRILLION OR TWO MORE OR THE WORLD IS GOING TO HELL, and for better or worse policymakers just don’t care. IMO, once the evil is done, there’s no easy way to fix things. Roubini may be right; but this is only in that an Austrian solution won’t work very well for a Keynesian system. Perhaps this system should die the way it was always intended by Keynes (he said something like: “if we all just hold hands together and leap off the cliff, we don’t actually reach bottom”; this sounds so like Larry Summers and all others in charge; let’s just print those trillions and see if we reach bottom or not; that’s why I have no respect for Keynes no matter how insightful he might have been in creating the macro-babysitter-assisted-economy). Well I figure that ultimately this will all get so bad that the uber-Keynesian solutions will be tried. I don’t know if you remember I have actually (half-jokingly) called for Paul Krugman to be given Ben Bernanke’s job, simply because I know that that is the endgame, and the sooner we get there the better, for eventually we may get back to a market economy. It’s in the 2nd or 3rd video here: http://ineteconomics.org/blog/inet/bringing-gunslinger-nicholas-wapshott-keynes-vs-hayek (the guy seems very defensive of Keynes; said something like “how can anyone imagine the US will not be able to pay her bills?” – indeed seems like a preposterous assumption :P). We are saved, because the G-8 agreed to save us! So nice for Cameron to talk about growth being better than austerity for Europe. Shame he prefers austerity for the UK. Thankyou Obama for the NDAA. We feel so much safer from protesting terrorists, I mean terrorists posing as protesters, sorry I will rephrase Protesters who could get out of hand and become terrorists. Growth over austerity is only for those who can afford it. EMU could have afforded it by buying more time with Eurobonds (not that buying more time necessarily would have led to better outcomes; the incentives to change anything might have been completely removed). From what I read, Cameron does a brilliant job by giving lip service to austerity (enough to maintain trust in the UK – which is required, as the UK is not the US) while not doing much of it. Nothing like Greece, and to some degree it is a show for bondholders. Seems pointless, though. The pound is a relatively strong and stable currency. Not sure what that graph shows… GDP % changes? A more useful one would be one indicating the exact amount/% of spending cuts or tax increases. But anyway, the GBP is a stable currency not because of any intrinsic qualities, but because of the same old trust. Just like for the JPY (as some say), that trust might evaporate all of a sudden.